The iPad, unlike the Mac, is designed as a single-user device. You don’t have the option to create multiple accounts, nor can you create more than a single work environment. But that doesn’t mean that the iPad needs to be left wide open, ready for any passing child to call up inappropriate websites, apps, music, and videos. You can have an iPad that’s both entirely accessible to adults as well as locked down to protect your children from unsavory content. The means for doing this is the iPad’s Restrictions feature. With restrictions enabled, you have the opportunity to selectively disable some of the apps pre-loaded with the iPad (though, regrettably, you can't disable third-party apps) as well as prevent your spawn from viewing or listening to inappropriate content. To configure restrictions you must first enable the Restrictions feature. On the iPad, go to Settings -> General -> Restrictions and tap Enable Restrictions. You’ll be prompted to create a four-digit passcode and then asked to confirm that passcode. (Memorable though a 1111 or 1234 passcode may be, choose something harder to guess. These are the first two passcodes a kid bent on unlocking the iPad will try.) 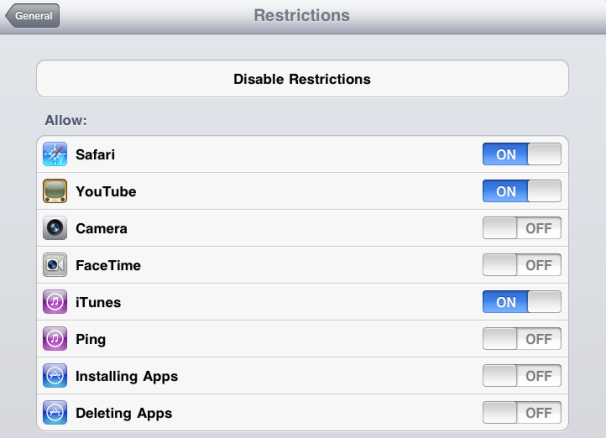 Now that you’ve enabled restrictions you can set about choosing what your kid can and can’t do with the iPad. In the app area you’ll find restrictions for Safari, YouTube, Camera, FaceTime (the previous two won't appear on a first-generation iPad, which doesn’t have a camera), iTunes, and Ping. The common element of each is that they provide the user a way to communicate with the outside world. The first you’ll want to tackle is Safari. Unlike with the Mac, the iPad offers no parental controls that attempt to keep your child from viewing inappropriate sites. There are a few third-party browsers that try to do this, but none has received rave reviews. So if you’re concerned in the least about your child stumbling upon something untoward, turn Safari off completely. Similarly, you can’t filter YouTube content so you may wish to also deny access to it if you’re concerned about what your child might see. iPad App Restrictions: The iPad provides controls for broadly limiting certain apps. The Camera app comes next. Though it may seem safe enough, bear in mind that once a child has taken a picture or movie with an iPad 2’s camera, they can then email it using the Share menu in the photo viewer. Also, if you haven’t disallowed the location feature altogether or for the Camera app in particular, any photos your kid may take with an iPad 2 will be geotagged, which could reveal where they (and you) live. When you switch off the Camera app, FaceTime is disabled automatically. 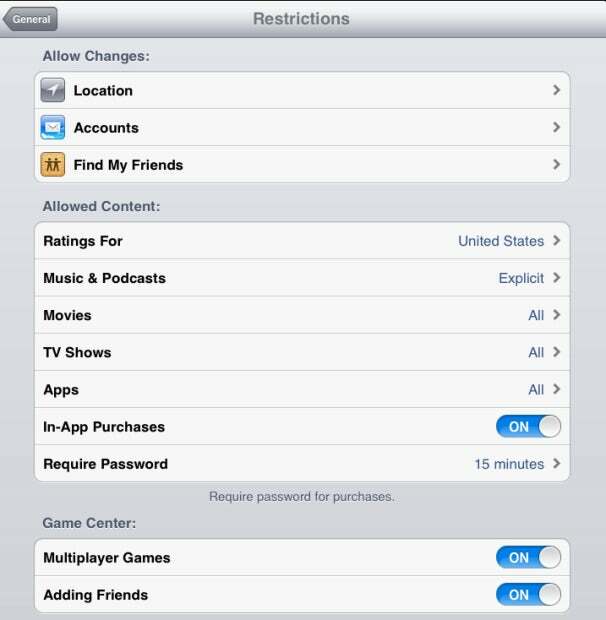 For Game Center, you can turn access to Multiplayer Games off, and also disable the Adding Friends function. Disabling iTunes will keep your child from visiting the iTunes Store to purchase or preview music and videos. And disallowing Ping keeps them away from Apple’s music-centric social networking service. Speaking of iTunes, it’s likely your child can figure out how to sync your iPad. In the process, they can sync apps to that iPad that you’d rather they not use. Switch the Installing Apps option off, and that problem is solved. And if your moody teen seeks a way to retaliate after you’ve disallowed installing apps, you might want to switch Deleting Apps off as well. Careful parents don’t want an iPad broadcasting their kid’s location. Although you can adjust the iPad’s location settings in the Location Services area of the Settings screen, Restrictions provides a way as well. Tap Location and you can individually configure the location settings for all the apps on your iPad. For example, you might turn off location for the Camera app and social networking apps for Facebook and Twitter. Or you can turn off location altogether with the Location Services slider. You can then lock down your current settings and prevent new apps from using location services by enabling the Don’t Allow Changes option. If you have Find My Friends—Apple's new app that lets iOS users track each other's locations—installed onto your iPad, it's especially important to enable Don't Allow Changes. This way, your child cannot make any changes to who can and cannot track the location of your family's iPad. It’s within the Allowed Content area that you can filter the content your kid can access. The first setting absolutely worth disabling is In-App Purchases, if you don’t want a child equipped with an iTunes account to rack up a huge bill purchasing game upgrades. Within the Music & Podcasts, Movies, TV Shows, and Apps entries you can disallow content based on specific ratings. For example, when you tap Music & Podcasts you can prevent the playback of any tracks, podcasts, or videos that bear the Explicit tag. Within Movies, you can let you child view G and PG movies, but not those rated PG-13 and above. Likewise, TV Shows purchased from the iTunes Store have a rating. Disallow any that are too mature for your child. Note, however, that these ratings are embedded only in content you get from the iTunes Store. If you’ve obtained movies and TV shows from another source, they won’t be rated and so these settings do no good. In that case the solution is to be careful about what you load on to the iPad. This isn’t a concern for apps, which are also rated, as the vast majority of people get their apps from Apple’s App Store. Anything you’ve missed? You might check your iPad’s Notification settings. Depending on who you follow on Twitter, a notification might pop-up in front of your 9-year-old that contains inappropriate language. You should also inspect the contents of your iBooks library for books you don’t want your young one to see.